A delicious recipe for Quinoa Almond Fruit Bowl from April Go Lightly. Start by boiling the Success® Tri-Color 100% Quinoa in a bag with water and almond milk following the directions on the Success box. While quinoa is boiling, mix together 2 tbsp almond butter and 1 tbsp agave. Remove the quinoa bag with a fork. 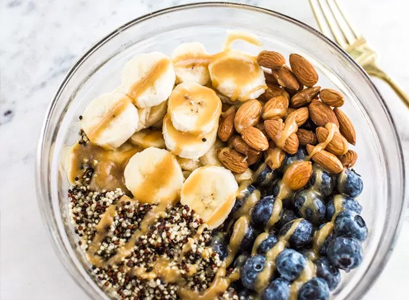 In a medium sized bowl, mix together the quinoa with 2 tbsp almond butter and 1 tbsp agave. Serve each bowl of quinoa with ½ cup quinoa mixture, ½ cup of blueberries, ¼ cup of almonds, and 1 banana sliced into rounds. Pour the almond butter and agave mixture over each quinoa bowl.